Moog Rogue 1/3-page square advertisement from page 25 in Keyboard Magazine March 1983. Why didn't Moog ever retrofit the Moog Rogue with MIDI? 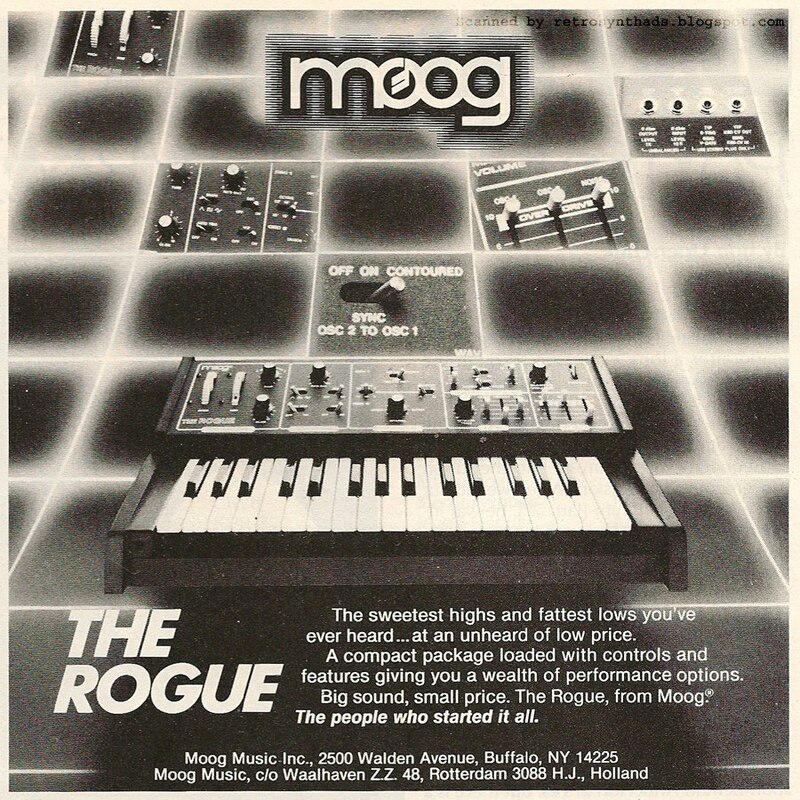 Advertisements for the Rogue continued to run for at least a year after MIDI was introduced, and I think it would have been a great little synthesizer to quickly pop a MIDI interface into. It would have been the cutest thing ever. But it seems Moog never did this (or at least advertise it). ...The Memorymoog is equipped with a new polyphonic-sequencer-plus-MIDI package which mounts inside the instrument and is controlled by the LFO section of the Memorymoog front panel. The package will also be available as a retrofit". 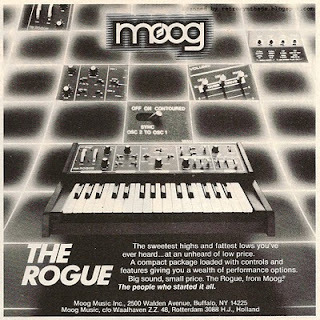 So, if Moog was doing it for the Memorymoog, why not the Rogue? Maybe cost? Can you see the problem? It's cheap if the synthesizer already has a microprocessor, which the Rogue unfortunately doesn't. So I guess Moog decided it wasn't worth the effort. Although a quick Google search shows that at least one third-party eventually did. Well, back to the ad. And it's an odd-ball. This advertisement appeared only once as far as I can tell. And it wasn't at the end of the long sporadic showing of the full-page, full-colour version of this ad, but smack in the middle. For some reason Moog decided - FOR ONE MONTH - to run a shrunk-down black and white version of that full-colour ad. The ad uses a modified version of the full-colour background. It's not just a re-use, the designer has actually moved the smaller photos to better fit within the matrix-squares in this ad's format. The ad-copy has also been pared-down to fit the smaller size. But in the end, it never lives up to the full-page version. The ad actually does one thing better than that full-colour version. The name of the synthesizer is in LARGE BOLD LETTERING. No need to go digging into the ad-copy to see what synthesizer this ad is for. I also kinda like the scan-line stroking that appears around the Moog logo - very TRONy. In the colour version of the ad, the stroke effect is a blend of colours that probably would have been lost when converting directly to black and white. The shape of the ad is what I refer to as "1/3-page square". It appears two columns wide, and only half a page tall. It is probably a good value for the advertiser that can't afford a half-page ad, but definitely wants more real-estate than the more common 1/6-pager (1 column, half page). But I would think that Moog could definitely have afforded full page advertisements, and in fact had been running at least one full page ad (sometimes two) in every issue of Keyboard since June 1982. AND, they continued to run full page ads after this 1/3-page ad ran, until April 1984 when they took another break from advertising at all in the magazine. Even more strange is that Moog ran *another* black and white 1/3-page ad in this issue for the MemoryMoog with a similar TRON-like background. So, that's really more like 2/3's of a page of advertising in the same issue. I'm not sure that running these two black and white ads would have been better than running one full-page, full-colour ad. Maybe they were trying something new. Maybe they just couldn't get the space that month.